Sometimes the universe seems to open up — delivering interesting ideas, people, and opportunities seemingly out of the blue. Or, as Elizabeth Gilbert puts it in Big Magic, it may be that we open up at various points in time, providing more space for newness to land in our orbit. These times in our lives feel full of optimism and hope – enabling us to make room for things we may have previously thought didn’t or couldn’t fit. January was one of these times of opening for me, and I responded by embracing everything that came my way. This was an unlikely time to approach the world with YES, with a small baby at home and the abrupt re-entry into the inevitable constraints of dual working parenthood. But at the same time, it seemed like the perfect time for YES – a brief moment when I was holding both urgency and possibility in my bare hands. So beginning in January, I started saying yes to every single thing (personal and professional) that came my way and sounded interesting. I treated each new interaction and concept as part of a puzzle that I was starting to piece together, knowing that I had no idea what the end picture was going to look like. Saying yes felt liberating and empowering and even exhilarating — until it didn’t. Last week, just two months into YES, I felt exhausted…flattened…spread way too thin. It was akin to going out too fast in a running race, crouching down mid-way to rest my legs, and wondering whether I could run the rest of the race with the same heart as I’d run the beginning. As I caught my breath and tried to figure out what had happened to the bright, shiny world of newness, I realized that without realizing it, YES had quickly taken on a life of its own. Rather than being intentional about making room for ideas, people and opportunities that seemed interesting and enriching, I had begun saying yes to everything — informational interviews, dentist appointments, brainstorming sessions, school pick-ups, weekend races, dinner hosting, and more. Until all I wanted to do was say NO. 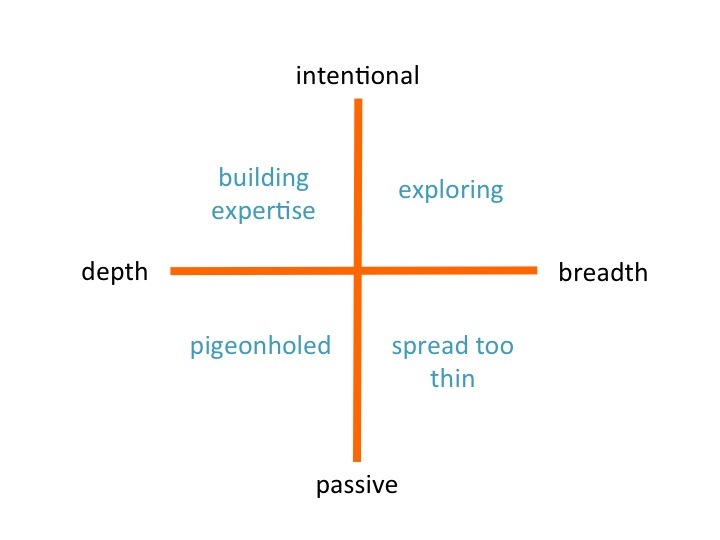 In short, we all want to be in one of the top two quadrants, and both are great places to be at different points in our lives. In fact, a period of exploration naturally leads to a period of focus; and that same period of expertise building can later give way to expansion. Both of these ways of living have dark sides (bottom two quadrants), which show up when we lose sight of intention. For example, my recent utter exhaustion was a result of an unconscious shift from the “exploring” quadrant to the “spread too thin” one. I’m now working to get back to “exploring” and stay there for awhile, until at some unknown future point, the exploration leads to deeper focus. The never-ending challenge of designing a life is about building clarity about what we want, who/what we’re living and working in service of, where we are on our journeys, and how comfortable we are in that place. It’s about balancing stillness and movement, expansion and contraction, depth and breadth. It’s about intentional YES’s, conscious NO’s, and the wherewithal to course correct when we need to. Open universe, I’m ready for you now. How do you manage periods of expansion/breadth and those of contraction/depth? I’d love any thoughts on what YES and NO mindsets mean to you. Love this so much – I have been in something for the past couple of not his – things are coming into my moment! Sending you love and thanks for writing and sharing your life with me!! this is very well said and constructed. i struggle with this and looking at it through a chart is really eye-opening. You have beautifully and simply captured the universal unbalance. The most unbalanced and overwhelming moments and seasons are those when I lose my intention – I have heard it said that saying YES and opening up space for certain things means saying NO to others. I humbly admit I am maybe more often than not unbalanced but am growing in my intentionality. Great visual! Thanks for sharing your thoughts on this. I like how you put it: saying YES intentionally and NO consciously. I often take a pause before saying NO just to consider, but I think that saying both YES and NO is powerful. I really like what you have to say here and like you right now I’m just trying to stay open to what the universe has to offer. My family is at the point where as you said, it is “enabling us to make room for things we may have previously thought didn’t or couldn’t fit.” Cheers to saying open.